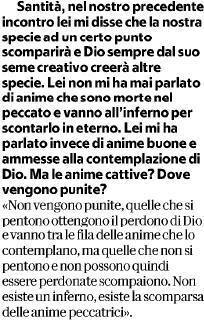 In another informal interview with Italian atheist journalist (and founder of liberal newspaper Repubblica) Eugenio Scalfari, published today, Pope Francis reveals that "hell does not exist". Title of the interview: "It is an honor for me to be called revolutionary." [Francis:] "They are not punished, those who repent obtain the forgiveness of God and enter the rank of souls who contemplate him, but those who do not repent and cannot therefore be forgiven disappear. There is no hell, there is the disappearance of sinful souls." Labels: Bergoglian Milestones, Francis Effect?